"All of the technology in the world will never replace the power in the touch of the hand..."
"Every time that I come for my DentalSpa™ appointment, it takes 10 years of stress off of me." "I look forward to getting me teeth cleaned every 6 months. Anyone who hasn't taken advantage of the DentalSpa™ cleaning needs to try it out!" 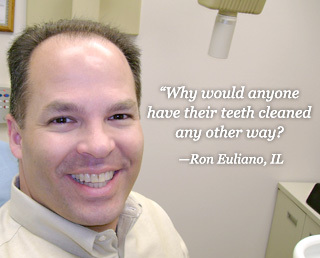 “Why would anyone have their teeth cleaned any other way?" “Thank you very much for introducing me to Oraspa™ – it was a wonderful experience and it's all I can talk about!! I wanted to write and share the name of the dentist my husband goes to so they can get that [Oraspa™] in their practice too." "My job has me moving frequently. After this experience I will only go to an Oraspa™ practice." "Amy [Oraspa™ Therapist], I will most likely keep coming to you whenever I visit Kansas. You've been the answer to all my dental discomforts! I never thought that going to the dentist would be something to look forward to!" "You [Oraspa™] have changed my dental practice completely...Thank You!" "This is going to be something really big in the future of dentistry"
"Thank you so much for creating the DentalSpa™. Our patients have never been happier and are eager to return. You are a real blessing, this has enriched all of our lives as well." "My staff has never been happier. This has created an exciting energy with my whole dental team! Thank you!" “My no-show or frequently cancelled patients are converts in consistency and arriving on time due to Oraspa™."